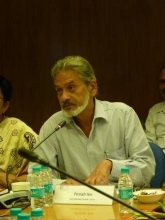 The fifth meeting of the Advisory Panel of the India Human Development Survey (IHDS-II), chaired by Pronab Sen, former Chairman, National Statistical Commission, was held at the NCAER Conference Room on August 11, 2016. The IHDS is the first large panel survey conducted jointly by the NCAER and University of Maryland for the same households at two points in time, viz. 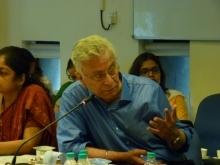 2004-05 and 2011-12, and is led by Sonalde Desai (Senior Fellow, NCAER and Professor, University of Maryland), Amaresh Dubey (Professor, Jawaharlal Nehru University, and Senior Consultant, NCAER) and Reeve Vanneman (Professor, University of Maryland). The goal of this programme is to document changes in the daily lives of Indian households including the way they live, work, educate their children, care for their aged parents, and deal with ill health. IHDS-I data were collected in 2004-05 from 41,554 households. This exercise was repeated in 2011-12 for IHDS-II, when the same households were revisited, with a high re-contact rate of 83 per cent after seven years, including 90 per cent in rural and 70 per cent in urban areas. The panel survey provides a rich empirical database available free of charge to a wide range of researchers in India and abroad. The IHDS data are currently being used by an estimated 7,000 users worldwide. 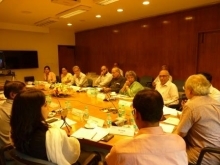 The Advisory Panel members who attended the meeting, apart from the Chair, Pronab Sen, included Satish Agnihotri, former Secretary, Cabinet Secretariat and currently Professor, IIT, Mumbai; Priyanka Bansal, representing Soumya Swaminathan, Secretary (DHR) and Director-General (Health Systems Research), ICMR; Ashwini Deshpande, Professor, Delhi University; Dipankar Gupta; G.C. 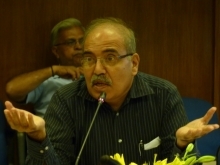 Manna, Director-General and CEO, National Sample Survey Organisation (NSSO); Arvind Pandey, Director, National Institute of Medical Statistics, ICMR; Ms Anna Roy, Advisor, NITI Aayog; Sayeed Unisa, Professor, International Institute for Population Sciences (IIPS); and Shekhar Shah, Director General, NCAER. 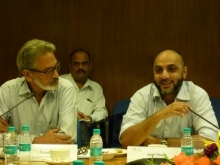 The IHDS project leaders, Sonalde Desai, Amaresh Dubey and Reeve Vanneman (by video conferencing) highlighted the achievements and challenges of carrying out the first large scale national panel survey in India. 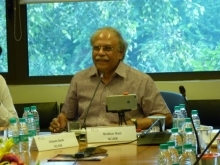 While delivering the opening remarks, Shekhar Shah stated that IHDS represents NCAER’s many forays into large-scale data collection since the 1950s and builds on the Human Development Profile of India (HDPI) initiated in the 1990s, which signified its first multipurpose household survey. He also highlighted the immense possibilities of the panel survey, with IHDS-II and IHDS-I being the second and fourth most downloaded data sets, respectively, from among the archives of the Inter-University Consortium of Political and Social Research (ICPSR), University of Michigan. The chair of the Panel, Pronab Sen said that it was important to decide if the IHDS should continue in its current form or assume a new form, especially since we are now on the cusp of starting IHDS-III. He also said that it is imperative to assess the extent to which IHDS-I and IHDS-II have predominantly been used as panels or as standalone cross-sections because the main purpose of the survey was to generate panel data. He said that developments in academia are also increasingly stressing the use of panel data. 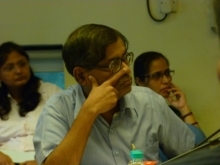 Amaresh Dubey suggested that access to multi-topic surveys like IHDS reshapes academic discourse by allowing researchers to examine linkages between economic and social transformations based on data that capture the day-to-day lives of people in India, and information on their earning patterns, income and consumption, migration decisions, and education levels, among other human development indicators. A number of presentations were made by IHDS researchers during the meeting to showcase the findings of the research team based on the data generated during the surveys. 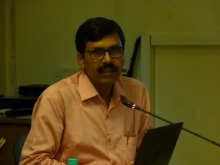 A presentation by P. K. Ghosh, Associate Fellow, NCAER, on ‘Attrition in and Validation of IHDS-II Data’, emphasised the intense supervision required to ensure re-contact with the original households and compared the basic characteristics of IHDS with other data sources like the Census and NSS. 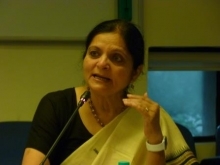 Outlining the challenges of public release of data, Sonalde Desai averred that though IHDS was designed as a public resource, it is simultaneously important to respect respondent privacy which prevents making identification below district level available to users. She noted that the high usage of IHDS is not only due to the worldwide interest in India but also because of the stringent quality checks and breadth of topics covered in the data sets. Over 200 papers and theses have been written using IHDS data. Three user conferences and one training session have so far been organised for users. 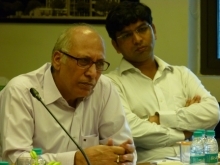 In his presentation, Debasis Barik, Associate Fellow, NCAER, highlighted economic status and mortality linkages. Since literature has not paid sufficient attention to the role of income in shaping the incidence of non-communicable diseases (NCDs) like diabetes, high blood pressure and cardiac disorders, longitudinal data is needed to address two-way causation. 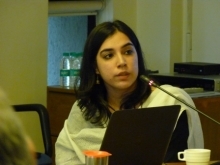 In her presentation, Ms Sadhika Bagga, Research Associate, NCAER, focused on ‘Demography of Inequality in India’, and claimed that research on inequality and poverty focuses more on countries and households and less on individuals. Thus, incomes grew and poverty declined for everyone during the period between IHDS-I and IHDS-II, but less so for children. The public policy challenge, therefore, is to implement more child-focused policy initiatives. 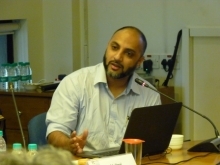 Studying ‘Poverty Incidence: Static and Dynamic’ in his presentation, Amit Thorat, Assistant Professor at Jawaharlal Nehru University, revealed that between 2004-05 and 2011-12, poverty fell from 37 to 22 per cent, signifying probably the largest reduction over any previous decade. He asserted that while poverty has declined substantially, households continue to fall into poverty largely due to the occurrence of catastrophic life events. Thus, different approaches are needed to deal with the chronically poor and vulnerable groups. 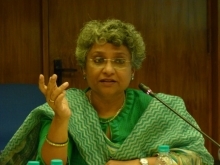 The meeting concluded with a delineation of the challenges of data collection by Sonalde Desai, recommendations for the way forward, and the need for institutionalising responses and the process of knowledge. It was decided that NCAER also has to marry the imperatives of ensuring best practices and high quality data generation with maintenance of the highest standards of confidentiality. The way forward entails planning for IHDS-III as more waves allow for better causal modelling. Another wave is needed to study the constant changes taking place in the socio-demographic landscape of India. An important development is the use of technological innovations by switching from Paper and Pencil Interviewing (PAPI) to Computer-assisted Personal Interviewing (CAPI), wherein the data is directly entered into a computer programme instead of using paper questionnaires. Other policy changes pertaining to decentralisation, DBT and financial inclusion, for instance, and the impact of welfare programmes like MGNREGA, JSY and expansions in safety nets over extended periods of time can also be studied through panel data. In addition, data on migration, which is an uncharted frontier, needs to be collected and analysed comprehensively as this social phenomenon has tremendous implications for socio-economic developments in a transitioning society. IHDS-III thus has a significant niche to fill in the research space.